Starting with a limited amount of resources and workers, you set out to run your lumber mill as efficiently as possible. Savvy investments and proper planning will ensure that your mill will be the most profitable. Be cautious, however, for competition is fierce! You will need to secure the best cutting areas, make use of limited contract workers, and continually update and replace your equipment. Your competitors are not the only thing to worry about as you will also need to store enough firewood and food to survive the harsh winters. 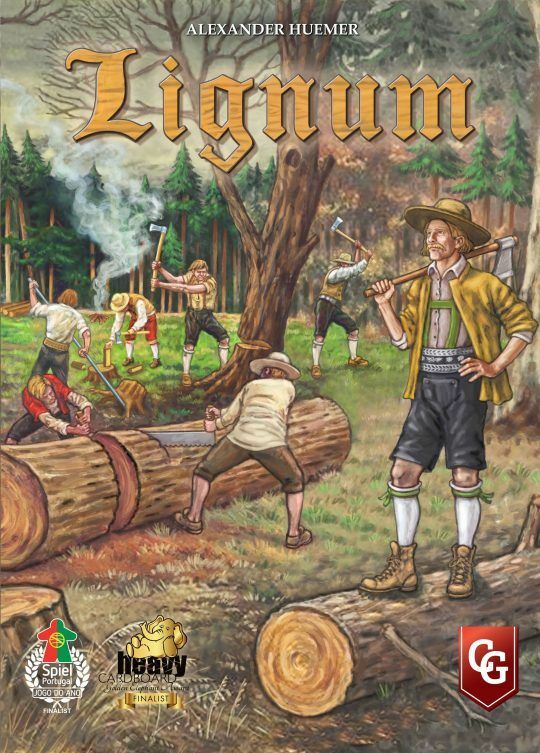 Lignum is a strategic optimization game that portrays the logging industry in the 19th century. Each round, players travel to the nearby forest, picking up tools and hiring workers along the way. After felling timber, players must decide how to transport their wood to their sawmills and if the wood should be processed or sold immediately, all the while optimizing their entire processing chain. The second edition of Lignum also includes the “Joinery & Buildings” expansion. In this expansion, players can visit two additional locations along the supply path. Players may now acquire special buildings that give them unique, special abilities for the remainder of the game. Additionally, players can acquire joiners to help generate more income each round; if those joiners are supplied with the appropriate wood, players can earn extra money at the end of the game!